DR-Web Extensible Agent is part of the CIAgent product bundle and EMANATE ONE. A trial version of CIAgent is available. DR-Web Manager provides a management platform that accesses SNMP-based information throughout a network using a browser. DR-Web™ Extensible Agent enhances the EMANATE® Agent making the SNMP MIB data Web accessible. DR-Web Agent is included with CIAgent®. DR-Web Extensible Agent allows users to access management information in an agent directly from a Web browser. This allows both traditional SNMP management applications and Web browsers to retrieve and configure the information made available by any EMANATE subagent. DR-Web Agent is made to operate with any Web browser and any SNMP manager. Also, Web pages that retrieve and display customized sets of management data can be created using HTML editors. The DR-Web Extensible Agent is ideally suited for customers seeking applications, systems, or device management solutions that are both standards-based and Web-browser accessible. The DR-Web Extensible Agent is one of two products in the DR-Web family of Web-based management tools from SNMP Research. DR-Web Extensible Agent: The DR-Web Extensible Agent enhances the EMANATE Master Agent providing it with an HTTP interface. DR-Web Manager: The DR-Web Manager provides a management platform that accesses SNMP-based information throughout a network using a browser. DR-Web products support integration of SNMP-based management with platform-independent HTML data retrieval and viewing technology; Java™ applets can be used to access the information in the DR-Web products. DR-Web's unique architecture provides users with easy access to management information from any Web browser. It preserves the standards-based format of management data required by software applications that use SNMP data. When compared to other Web-based management solutions, DR-Web's primary difference is the level at which SNMP/Web integration takes place in the agent/management architecture. The DR-Web Extensible Agent is actually a cleverly designed enhancement to SNMP Research's popular EMANATE Master Agent/Subagent system. 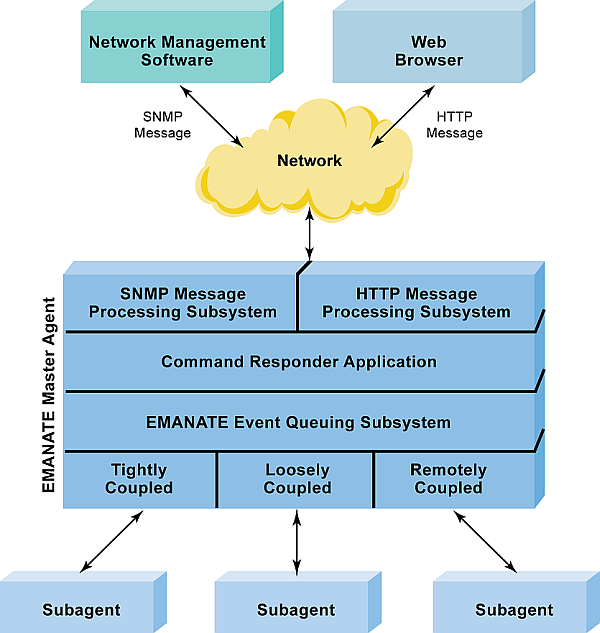 With the DR-Web Extensible Agent, SNMP Research has extended the EMANATE Master Agent to support an HTTP interface as well as the existing SNMP interface to the event queuing subsystem. DR-Web Agent converts HTTP requests and SNMP requests to EMANATE events, dispatching them to the appropriate subagents. Because this modular architecture requires no changes below the event queuing subsystem, all customer investment in EMANATE-based SNMP subagents is preserved. The layering approach also allows for future support of other protocols such as the HyperMedia Management Protocol (HMMP), without requiring changes to the master agent/subagent relationship. The DR-Web Extensible Agent is ideally suited for customers seeking applications, systems, or device management solutions that are both standards-based and Web-browser-accessible. Using the automatic code-generation tools provided by our subagent development kits, customers can easily generate subagents for monitoring critical application processes. Checking the status of an application or changing its priority can then be accomplished at the nearest available Web browser. Because DR-Web products take advantage of Web-based security mechanisms as well as SNMPv3, they support both authentication on an individual-user basis as well as authorization and access control per group-based policies. The DR-Web Extensible Agent also provides significant benefits to OEMs wishing to add Web access features to their SNMP-manageable products. For developers, DR-Web's single-stack approach reduces the coding effort as well as the memory requirements for embedded systems. End-users benefit from enhanced reliability and functionality provided by DR-Web's cleanly structured design. DR-Web Extensible Agent features are listed below. Enhanced security through multilingual support of SNMPv1, SNMPv2c, and SNMPv3. The DR-Web Agent supports a single-stack architecture for accessing SNMP data from SNMP managers or Web browsers. By merging SNMP and Web technology at higher layers in the stack, DR-Web provides a single path to critical management information. DR-Web's architecture helps prevent problems with SET synchronization and data naming inconsistencies that may result from dual-stack implementations. In contrast, competing approaches that support dual paths to management data run the risk of allowing users to obtain and operate on inconsistent versions of data. The DR-Web Agent offers SNMPv3-based security features for authorization and access control. Activation is simple: after the browser operator has entered an SNMPv3 username and password, each exchange between the browser and the DR-Web agent is checked against an access control table. Access control tables can be easily configured to allow, for example, authorization of an operator or groups of operators for viewing certain MIB variables but not others, or to view and set certain MIB variables but only view all others, etc. Supporting authentication per-individual and authorization per-group maximizes DR-Web's flexibility and ease of administration with respect to security management. where the host is the host name or address for the computer running DR-Web, and subtree specifies the starting point for browsing the SNMP MIB. Port 280 is the proposed port for Web-based management, pending approval by the IETF. Upon receiving the HTTP request, DR-Web Agent retrieves information from the Subagent and dynamically creates HTML pages for the SNMP MIB data. In addition to displaying dynamically created HTML pages, DR-Web Agent can insert live SNMP MIB data into static pages that have been designed ahead of time with a pre-defined layout (usually, this is done to group related SNMP MIB variables together on one page). For example, network administrators may want to create a page called "routerhealth.html" which contains only those MIB variables of interest to them. Operators can retrieve this customized page again and again without re-specifying the MIB subtrees. Current licensees of EMANATE and its Subagent Development Kit need only upgrade their master agent to get the DR-Web extension. The DR-Web Master Agent binary provides a binary copy of the required master agent and MIB-II Subagent for use with DR-Web Subagents. The right to copy DR-Web Master Agent binary grants end-users the right to produce and use copies of the DR-Web Master Agent binary. DR-Web is available as a software upgrade to existing EMANATE customers, or as a full stand-alone software product.